Pretty much every single blog I read prior to my trip to Myanmar said that Burmese food wasn't anything special. They talked about overly oily and boring curries, with the occasional mention of someone that really enjoyed the national dish: lahpet, or tea leaf salad. Not gonna lie, I was pretty put off by most of the food I saw initially. Even in really beautiful photos, a lot of the dishes just end up looking like piles of mush. Not exactly appetizing. But after digging in, I can report back that I enjoyed just about everything I tried. I don't dream about Burmese food the way I fantasize about pasta in Italy or really good larb in Thailand, but writing this post has definitely inspired me to go check out the Myanmar restaurant in my neighborhood. Here are my top recommendations for dishes to try ~ whether you're actually planning a trip to the country or just want to find some local Burmese cuisine. Looking for a little extra caffeination in your day? Why not make an entire dish out of tea leaves?! Seriously, I thought this was the strangest thing when I first heard it, but one bite in and you'll completely understand why everyone in the country - regardless of religion or social class - is all about it. Native to Myanmar, the lahpet tea leaves are pickled and fermented before being added to a salad of shredded cabbage, sliced green and red tomatoes, and crunchy nuts and beans. Mix in a little chili and garlic and you've got yourself one hell of a delicious dish. Just don't overdo it to avoid an increased heart rate and other symptoms of too much caffeine (no joke!). My favorite version came from Fingers Food Garden ~ just down the street from Pickled Tea Hostel. 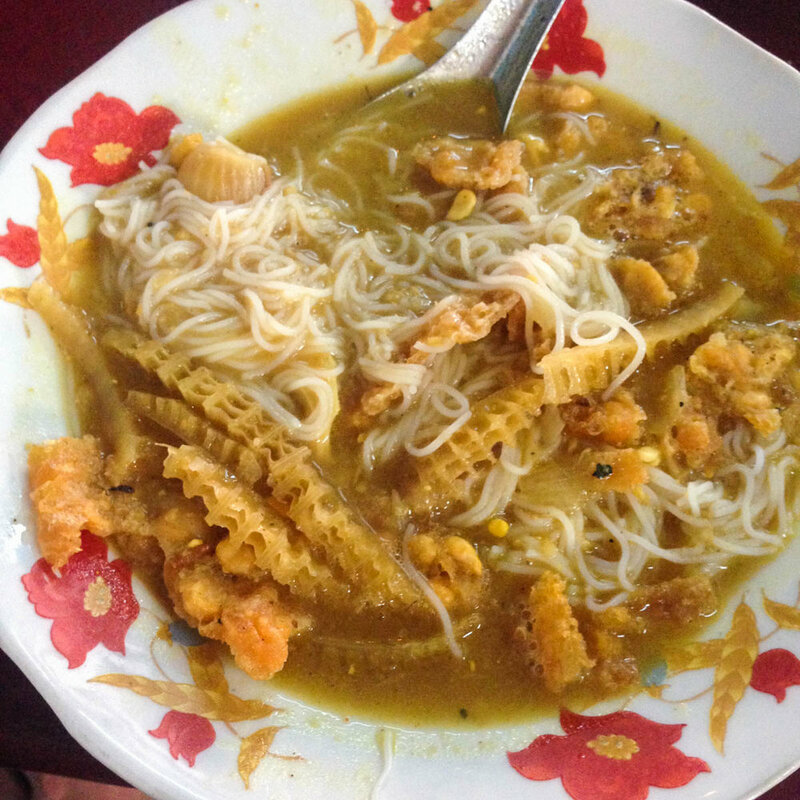 After tea leaf salad, mohinga is the second most recommended dish in Myanmar. As someone who is only starting to warm up to seafood, I instantly brushed this one off when I found out the stew was made up of fish paste and catfish. But after working up an appetite exploring around Bogyoke Aung San Market in Yangon one afternoon, I caved into trying some from a street cart surrounded by locals. I loved it. There was no fishy taste whatsoever, and the noodle-y, soup-y deliciousness warmed me right up as it started to rain. I'll always welcome a little crunch in whatever I'm eating, so the banana stems and crispy chickpea fritters on top really brought it together for me, while the garlic, ginger, lemongrass, and onions provided an extra level of flavor. It was pretty much mohinga and tea leaf salad from there on out. If you're in need of something quick, simple, and dirt cheap, Shan noodles are the way to go. Hailing from the Shan State in Northern Myanmar, Shan noodles can be made in a variety of ways. It typically consists of rice noodles in broth with pork or chicken and topped with sesame seeds. You can switch it up and have it dry or mix in the pickled vegetables served on the side. Nothing super special, but always dependable. So, the stories were true: most curries in Myanmar are super oily, especially compared to those in neighboring countries. But you have to give the Burmese props for the all-out feast that accompanies a single curry dish. You order one type of curry, and the next thing you know, your table is full of plates piled high with veggies, a soup to start the meal, and all sorts of spices and mix-ins to tailor your dish to your taste buds. For those seeking variety in their meals, this is the way to go. But don't forget to save room for the traditional dessert that comes at the end! These little palm sugar balls are served after nearly every meal, and are said to aid digestion. They offer just the right amount of sweetness to balance out a savory curry spread. I hope to return to Myanmar one day to get even more adventurous with the food and see the balloons over Bagan that I missed on my first trip. But I'm grateful to know that I hit the highlights and hope this will help you feel a little less lost when it comes to Burmese cuisine.